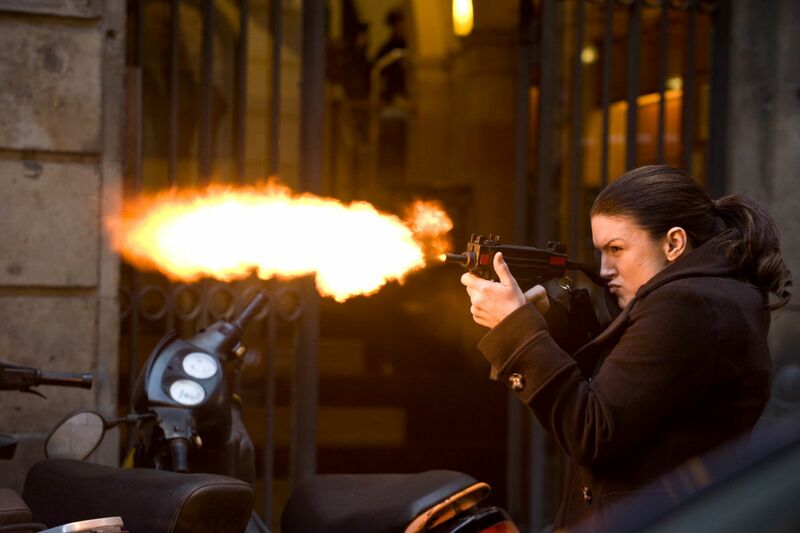 Former MMA fighter Gina Carano stars as Mallory Kane, a freelance spy on the run from the private contractor who betrayed her. Carano, who has never headlined a film before, is a pleasant surprise; her character, like everyone else in the film, is a total blank on the page, but Carano at least manages to make Mallory into a genuine badass, and her remarkably authentic physicality is a wonder to behold. She’s so awesome in each of her fight scenes that Soderbergh could easily have made this into a balls-to-the-walls action movie, though he wisely refrained, instead opting for a meticulously paced spy thriller, one more focused on story than on combat. It’s not even remotely in the same league as something like “Tinker Tailor Soldier Spy,” but it’s a solid espionage narrative, told, for the most part, with clarity (there’s a flashback structure that is entirely useless and often muddles things, but it’s not a huge flaw), and having a strong narrative backbone adds valuable weight to all of the action. Soderbergh keeps things visually engaging at all times, with aesthetics that are both playful and precise and a controlled, effective staging of several impressive set pieces. He even manages to create genuine thrills even when no one is being punched in the face, and a delightfully fun musical score by “Ocean’s Eleven” collaborator David Holmes elevates the entire film. In short, nearly all the pieces are in place for a truly effective spy movie, and if someone along the way had realized the script makes no effort whatsoever to humanize the characters, I think “Haywire” would be something worth celebrating. The ensemble is so good that we do, at times, get the illusion of well-rounded characters; Michael Fassbender is charming and dangerous as an MI6 agent (and gets to use a truly awesome British accent), Ewan McGregor is suitably slimy as Mallory’s villainous boss, Michael Douglas does a fine job playing….well, Michael Douglas, and best of all, Antonio Banderas appears in a few scenes with a truly spectacular beard and that wonderful, magnificent voice of his. Yet even with Banderas, I found myself thinking less about his ‘character’ and more about how incredible it would be if he started narrating Penguin documentaries like Morgan Freeman. None of these characters truly held my interest, with Carano coming the closest only because she’s very good at beating people to a pulp. I can’t quite recommend “Haywire,” but I can’t quite write it off, either. It has only one significant flaw, and though that flaw killed the experience for me, I can’t say for sure if it’s something other viewers will care about. I could easily see someone walking out of “Haywire” giddy with glee. For me, though, it left almost no impact, and once I finish posting this article, I doubt I’ll ever think about it again.